What do you get when you combine Harvest Moon style gameplay with SNES-style 16-bit retro graphics? Stardew Valley, the brand new farm simulator from ConcernedApe, that has literally taken the Twitch and video game world by storm. 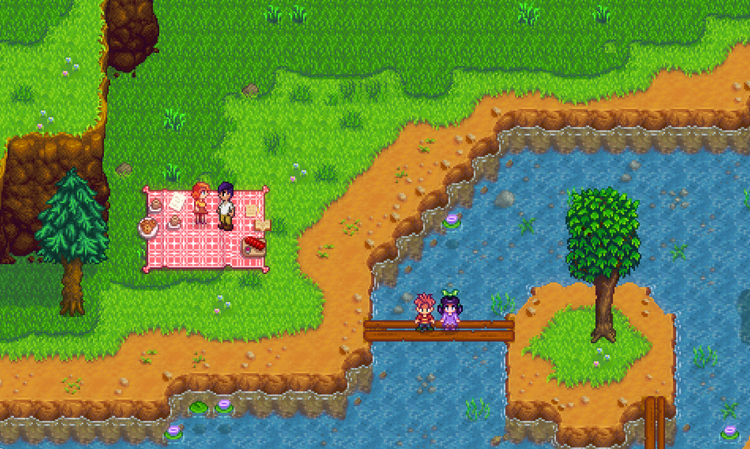 Oh, and perhaps the coolest element about Stardew Valley: it’s also a dating simulator, so you can go on dates, fall in love, and get married to the 16-bit man or woman villager of your dreams. So naturally, since this game has taken the Twitch and video game world by storm, we had to publish a top list of the funniest Stardew Valley tweets we’ve seen on Twitter. So without further adieu, below please find the twelve best #stardewvalley tweets we’ve come across on Twitter. If you’re not following that hashtag, and heck if you’re not following us (@LFGdating), then you’re sorely missing out on both fronts. You’re also missing out if you haven’t at least tried Stardew Valley out on Steam – trust me! Enjoy the Stardew Valley tweets, and best of luck in your 16-bit courtships! FYI, if you're looking for love in Stardew Valley, I don't recommend giving people sap or raw fish. They don't like it, apparently. Playing #StardewValley gets uncomfortable when my girlfriend gets jealous of my character's love interest. @whitneyarner Based solely on your twitter, I believe that Stardew Valley is a dating sim about vegetables. So I'm actually kind of having an emotionally fulfilling relationship with my Stardew Valley husband and it is weird. When you’re ready to find video game, gamer, or geek love IRL then you’re in the right spot! Create a profile for free today at LFGdating – chances are you’ll find plenty of gamers who enjoy Stardew Valley as much as you do!